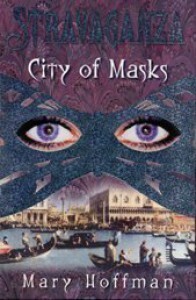 I'm not much of a YA novels reader, but this book was suggested by a friend and deals with an alternate universe version of Italy, so I was curious to give it a check. Much to my surprise, I ended enjoying it quite a bit. The world building is really interesting and well done, and quite interesting from my own point of view. As an Italian, it's curious to see the not-Medici (or Chimici, as they're called in this book) being the "villains" of the story: due to the history of the country and its fragmentation under different types of government, dynasties and forms of government that succedeed themselves through the centries, each ruler or dynasty of the past has a greatly different reputation depending on the zone of the country. At times this can manifest in the same region, if not the same city. The Medici on the other hand seem to be the one family that's mostly immune to this, having a generally overall positive reputation throughout the country, mostly thanks to their role as patrons of arts and their contribution to the development of the Renaissance. So seeing them being treated as political actors in an intrigue, and not under a positive light, is a bit strange but also refreshing. As for the story itself, I found it interesting, if a bit low key. At points it gives the impression it's going to get bigger and more action oriented, but never actually pays off on that front, and instead mostly focuses on the political stuff - and even on that front, it's more a matter of behind-the-scenes affairs. It's not a bad thing, I really liked it, but it felt a bit like a bait and switch. In general, the way the main story ended left me with the feeling this was written just as the first part of a trilogy, rather than a self-standing book. It might just be the knowledge there are other books after this coloring this impression of mine, I'll see. Finally, I really liked how towards the end the author decided to take a risk and went for a bittersweet, more realistic ending to a character's story. Definitely something I wasn't expecting from a YA novel, I'm sincerely and positively surprised. I'll definitely read the other two books in the series, to see if some of the issues I had with the first one are just due to it being the first "chapter" of this story, or if it's a deliberate choice from the author. I'll come back to this after I'll be done with the whole trilogy, but for the moment my opinion is: good book, with a few very interesting moments and some moments that sincerely defy expectations.